I’m sure you can agree that, at the end of the day, you don’t always feel like cooking a big meal – especially during the week. I hear ya, we’re in the same boat. On the flip side, I most definitely do not want take-out. I just want something simple, but wholesome. I’ll even settle for semi-wholesome. If I can integrate at least one vegetable in the mix, I feel like I’ve accomplished something. And that’s probably why I make nachos for supper at least twice a month. Maybe three times. Don’t judge. The way I see it, nachos are semi-wholesome. I load mine with red peppers, green onions, black beans, corn, pickled peppers, tomatoes and sometimes, avocado. Vegetables for the win! Nachos are also a super easy way to clean out the fridge. Being a food blogger, I always have weird odds and ends hanging out in there. Can any of you other bloggers relate to this? Take last week for example. I had two open bags of Que Pasa corn tortillas, half a ring of Chorizo sausage and black beans left over from my Tostadas. I rummaged a little more in the fridge, and found a whole chicken breast from Monday’s lettuce wraps. Nachos to the rescue. Have you ever made nachos in the oven? It’s the only way to go! The cheese melts nicer, the chips get crispy instead of soggy, and you can make mass quantities at one time. And when you’re making nachos as a meal, you need mass quantities! Amigos, there's no need to measure anything! Add as much or little of each as you want. 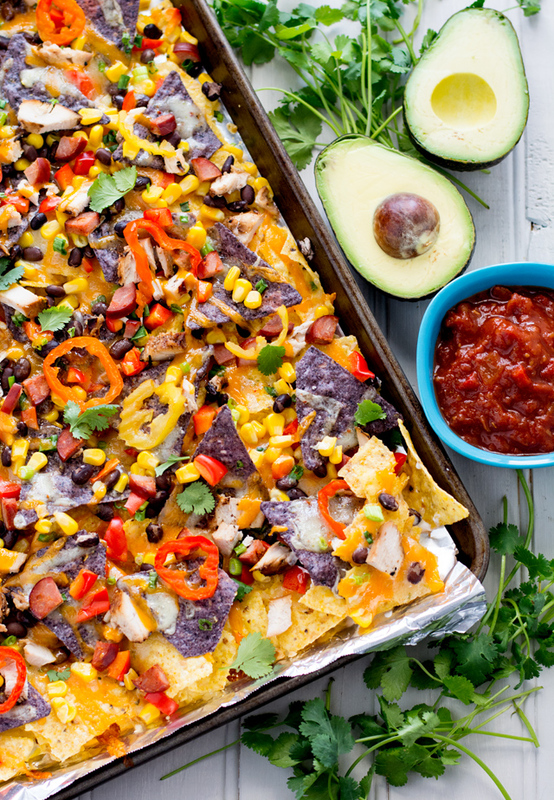 Use this "recipe" as a guide to create your own sheet pan nachos. Line a large baking pan with foil. Scatter an even layer of tortilla chips on the bottom, overlapping slightly. You want to make sure each chip can get a little bit of the toppings. Add a layer of each topping you plan to use (corn, black beans, chicken, chorizo, banana peppers, jalapeno - whatever!) Top with the cheese. Add a second layer of tortilla chips and repeat with the toppings. Bake for about 10 minutes or until the cheese has all melted. Serve with cilantro, avocado, guacamole, sour cream and/or salsa. No judgement here on nachos two times a month… I’m with you, nachos make a great meal. You can pile on the veggies, use up odds and ends, and get a healthy dose to oooey gooey comforting cheese. Nachos for win!!! Sheet pan nachos is my favourite way of making nachos! These look great – and yes, it’s a fab way to clean out those odds and ends of food blogging things! Nachos our one of our favorite things! I always have ziplocs of leftover pulled pork or pulled beef in my freezer just for nachos! Nachos are one of my favourite “what do I do with this half-finished bottle of salsa?” meals. 🙂 I totally love that you used multiple layers of chips and toppings together… one of my biggest pet peeves when I order nachos somewhere is when you get through the top layer of stuff and realise there’s just a big pile of naked tortilla chips underneath, and that’s just sad. I was looking for a nacho recipe for dinner with my family when I stumbled on this post. Really my fridge was full of ingredients and didn’t how to use them. Why not do nachos, right? Everyone here at home loved the idea! Thanks!! Awesome post!